It's a rarity when an established product gets a useful makeover. Today's usefully made over product? The scale. Now I've posted a fair bit about scales over the years. I've talked about scale seduction, scale avoidance and how often you ought to be weighing yourself. An overarching theme to all my thoughts and comments on scales has to do with the fact that how much you weigh isn't important, what's important is what you're doing about what you weigh. Similarly there are no ideal weights and you shouldn't strive to achieve a specific BMI. Instead you should strive to live the healthiest lives you can enjoy whatever your weight is living that life, well that's what I call your "best weight". I've watched scales beat people up regularly. Someone's doing phenomenally well, has lost dozens of pounds and then they stand on a scale and it's not down enough, not down at all or slightly up and suddenly they forget about the fact they may be down dozens of pounds and the fact that they're living a healthier lifestyle and instead they focus on that 1 pound gain that suddenly has them feeling like they're failures. Similarly I've had people who just can't get past the actual number on the scale and regardless of how incredibly they're changing their lifestyles for the better, every time they see that number it defeats them. 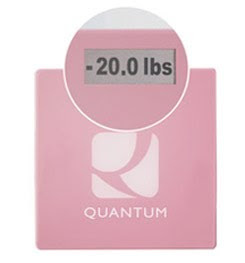 The Quantum Scale is a scale built for one and the premise is simple - it doesn't ever tell you your weight. Step on the scale for the first time and internally the scale registers your weight and saves it. Everytime you step on it thereafter it tells you how many pounds up or down you are from when you first stepped on the scale. I love it because it de-emphasizes the what you actually weigh aspect of the equation. - I recommend they enable a feature that would limit the number of times per day or week that it's used. Stepping on a scale multiple times a day just proves that you're too tied to your scale. Having the option of the scale locking you out and allowing for either a single daily or a single weekly weigh-in would help combat scale addiction. - I recommended they add a small flashing LED that similarly would go off after a pre-set time of not weighing oneself so as to combat scale avoidance. - I recommended they increase the width and depth of the scale so as to make it easier for larger folks to stand on. - I recommend they create a raised, angled or detached readout so that folks who may have difficulty seeing the number can mount it off to one side or have it high enough that they can see the numbers. Right now the scale is good to up to 330lbs. Hopefully newer versions will have higher weight capacities as well. Despite those features that I wish were present indeed in my mind this is a quantum leap forward in scale design. If you want one of your very own you can buy them from their website for $89 and if you add in the code QSXMAS then at least for now you'll get yours for $66.75.